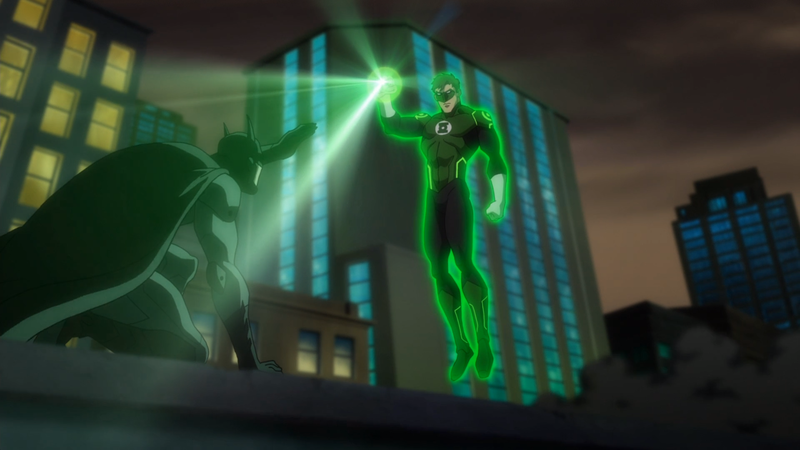 Characters are lacking in ways and didn't like the Green Lantern's portrayal, which was also indicative of them being one-dimensional at times. 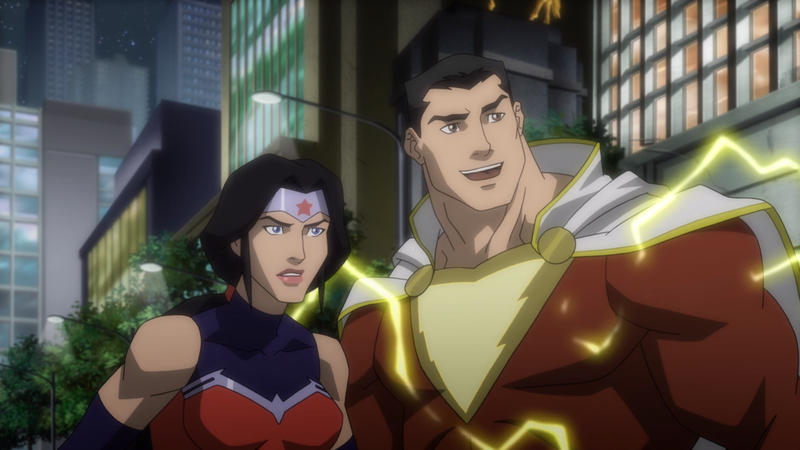 Justice League: War is a DC animated movie based on DC comic’s New 52 reboot of its flagship characters as they have to unite to face a grave threat that jeopardizes the entire planet. It opens up in Gotham with the Green Lantern pursuing a hooded monster who throws a woman off a building in order to slow him down. Since this world is unfamiliar with superheroes, the woman doesn’t know how to respond to Green Lantern and whether or not she should just thank him or if he’s expecting money from her. This gives the monster enough time to gain the advantage over him as he gets pummeled until Batman jumps in since he was tracking the monster as well. Green Lantern is sidetracked once again as he can’t believe Batman is actually real, and this results in the monster flying away as the Gotham PD view the two of them as much as a threat as the unknown monster. After an amazing action sequence through the streets of Gotham, Batman and Green Lantern track the monster into the sewers while awkwardly getting to know each other. Apparently the monster’s goal was to plant another device, which they’re able to retrieve after finally defeating the monster. But it’s unlike anything they’ve ever seen before and even Green Lantern’s ring can’t analyze it so they don’t have a clue about its intended use. And it’s not just in Gotham as these devices have been planted by other monsters in other cities and no one has had any luck identifying them, including the Flash. And with reports of Wonder Woman in Washington, D.C., and Superman in Metropolis, the public is uneasy about all these “alien” visitors and can’t distinguish between friend or foe. With Earth’s strongest heroes unknown to each other but aware of a lingering threat facing the entire planet, can they unite in time to put an end to a nefarious plot or will they need help from unknown corners to usher in a new age where the planet is safe from even the worst threats? 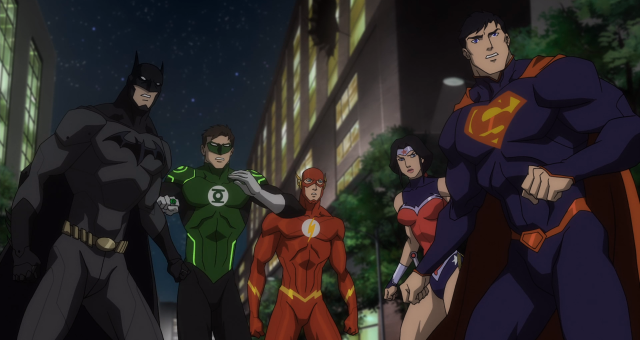 After watching the Flashpoint Paradox and then seeing the preview of Justice League: War at NYCC, I was pretty excited to finally be able to see it, especially since I enjoyed the issues it was based on. I was excited about the voice casting after getting a sample of it and the action sequences shown were intense. That representation was indeed true as this one opened up with nonstop action as Batman and Green Lantern attempted to take down the monster. One thing I noted about the Flashpoint Paradox was the portrayal of the Flash in a more serious role compared to his previous portrayals in DC’s animated movies, and apparently the role of jester was passed on to Hal Jordan, the Green Lantern. The movie was just getting started so I didn’t have a problem with it then and the banter between him and Batman was entertaining when he was shocked to learn Batman didn’t have any special powers. And the story was being set up very well with the mysterious devices of unknown origin being planted in different areas and this was an entertaining way to introduce the other characters and draw a connection between them. 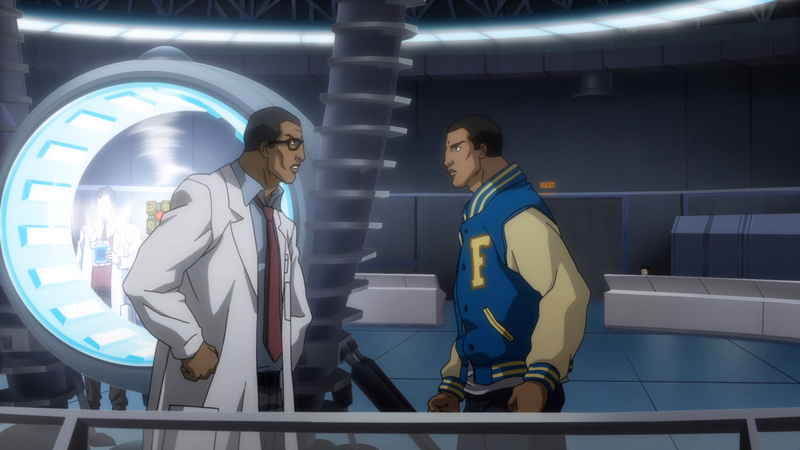 Cyborg, or rather Victor Stone, is a football QB having problems with his absentee father who works at S.T.A.R. Labs and is researching one of those devices with just as much luck as the others. And even though Victor and Billy Batson, who is secretly Captain Marvel, would slightly bond after the game, Victor would still have the strong urge to go see his father at the laboratory to express his anger. I didn’t have a huge issue with the relationship between Victor and his father because it was used to advance the story and give Victor a reason to be in the lab when the device would be activated, effectively merging with him turning him into Cyborg. I did feel that the meeting between Green Lantern, Batman, and Superman fell into a bit of a cliché with Green Lantern’s tiring jester act overshadowing what should have been a more legitimate reason for them initially getting into a fight. However the action was great, and Superman was every bit as impressive as Batman warned Green Lantern he would be but if you’re a huge Batman fan you might not be too pleased with this entire sequence. If you’re a Superman fan you’ll love it. And of course I don’t usually compare the way a story unfolds in a DC Animated movie to how it unfolded in the comic books but this one time I wish they kept the meeting initially between the 3 just mentioned and Flash because the battle would have been even more incredible. Story wise it worked because the Flash would be used as a connection to Cyborg since he would be present there when the device would activate bringing in a horde of monsters from the planet Apokolips. Wonder Woman would have her own story line in Washington D.C. as her interaction with the public would signify how superheroes were viewed as a whole by a public that had up to this point no true reason to trust them. It had its humorous moments before the action would start, and when it did it was as impressive as the other action sequences. There is no lack of action in the entire movie and that’s definitely the most enjoyable aspect. The story is entertaining as it’s revealed that the devices left all over the planet were to transport invading forces from Apokolips as Darkseid was implementing his plan to gain control over the Earth and terraform it. So of course this would be the perfect reason for all these superheroes to unite but the characters seemed lacking for the most part. I’ve come to accept that all DC’s animated movies will have about an 80 minute limit so in one with this many characters it’s not going to be possible to have developed backstories for every single character but in that time frame different characters shouldn’t react to a new situation the same way with them ending up attacking each other mistakenly before a word is said. And as a result there are moments where they come off as archetypes instead of unique characters. So they’re at their best when fighting and orchestrating their actions against Darkseid but their interactions outside of that are when they’re at their weakest. And since the action is pretty electrifying, the final third of the movie allows you to sit back and enjoy the ride for what it ultimately becomes, a nonstop slugfest with a satisfying conclusion.